Low flows are much more common on the Caney now. A corresponding increase in fishing pressure was obvious at all the major access points this past Friday. I arrived at the river around 2:30 in the afternoon and spent the first 20 minutes checking all the main access points from Happy upstream to the dam. With all the other spots crowded I settled on fishing at Happy. There has been a lot of discontented rumbling about the river for weeks now, and I was really curious to see for myself how the fishing was. While I can’t provide much optimism, I can report that there are still at least a few fish in the river. The first rig of the day was my Caney standard of a dry and dropper. After fishing for a good long while without catching anything, I decided to sit on the shore and just wait for something to rise. Once, a larger fish that had already rose a couple of times swirled on the surface across the river. However, I wasn’t about to wade across the river again unless the fish showed some consistency with its rises. After waiting for around 30 minutes, a fish rose out in the middle, just out of casting range from where I was sitting. A couple of minutes passed before it rose again, and then again. Finally, a fish with a rhythm. Wading quietly out while stripping line off the reel, I started casting. The first cast was about a foot long and the fish rose between me and my fly. The second cast was perfect and a sudden swirl proved the fish was hungry. A major battle ensued as I brought the huge 8 inch fish to hand. 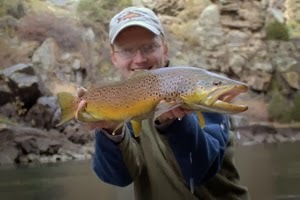 The fish didn’t really fight much, and I quickly removed the hook to get the little brown back in the water. Encouraged, I started probing the water again. Blindly covering water just wasn’t the answer so I finally reeled in and started walking down the bank while thinking about just calling it a day. Just before turning to head up the ramp, I saw a rise and decided to give it another shot. Again, I fished for awhile without hooking up. Finally I found a fish with some consistency and made up my mind to catch it. For such a little fish, it proved very difficult to catch. There wasn’t a very good rhythm to its rises so I just kept casting away. By this time I had tied on a small #20 parachute pattern that was close in color to the blackflies that were hatching. 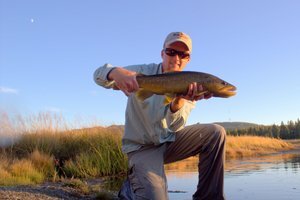 I probably cast over this fish for 30 minutes. Normally on the Caney I wouldn’t waste that much time on such a small fish but there weren’t exactly tons of fish to be caught and besides, I wanted to catch fish on dries. Finally, after what seemed like an eternity, I hooked the little fish and decided to take a quick picture. Sometimes I’m just as proud of catching little fish as I am of big fish. It is all a matter of perspective and the little brown I caught took a lot of patience and persistence. I fished for just a few more minutes before deciding to call it a day. It was really nice to be back on the river again. I wish I could provide more optimism about the fishing but for now things are going to be tough. The river will fish well again but it may take a few months. 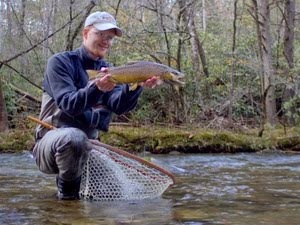 Thankfully it is time to really start fishing hard in the Smokies and the warm water species should be turning on soon as well. I just ordered a float tube to aid in fishing area lakes and ponds. With the price of gas creeping up again, I’ll probably spend more time this year looking for local alternatives to trout fishing. Just read your post on the Caney. I too am waiting for the Caney to come back. 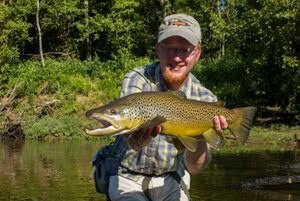 I had a guide trip planned with David on Southeastern Fly for the 2nd of April, but we rescheduled the trip for June. I am not impressed with the Caney right now. It seems that TVA has no interest in the welfare of the trout fishermen below the dam. One of my best trips was last August with my son-in-law. That afternoon we landed more than twenty trout in less than an hour. After that the generators took over and we left. I haven’t read any good reports on the Caney in a while. Like you I am looking forward to the bluegill fishing in about 2 to 3 weeks on our local lake here in Jasper. That was too much fun last year with my 3 wt. rod. I hope David can put me on some great fish in June. I would really like to learn to fish streamers and David is an expert in that area. I just want to learn more about the Caney especially using a small boat. I am one of your satisfied followers. Ha! I always like to say it's not a small trout's job to be selective. They're supposed to be easy! Somehow we don't seem to mind as much if they're big and picky. Still, selective fish are more interesting no matter how big they are. Since I'm new to the area and have only fished the smokies a handful of times, I am anxious to get out there! I appreciated the honesty and descriptiveness of this post. 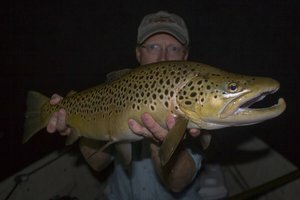 My main thought is that even if you only catch a couple of not-so-big trout, you are still FISHING and in beautiful east Tn to boot! !